A media market, broadcast market, media region, designated market area (DMA), television market area, or simply market is a region where the population can receive the same (or similar) television and radio station offerings, and may also include other types of media including newspapers and Internet content. They can coincide or overlap with one or more metropolitan areas, though rural regions with few significant population centers can also be designated as markets. Conversely, very large metropolitan areas can sometimes be subdivided into multiple segments. Market regions may overlap, meaning that people residing on the edge of one media market may be able to receive content from other nearby markets. They are widely used in audience measurements, which are compiled in the United States by Nielsen Media Research. Nielsen measures both television and radio audiences since its acquisition of Arbitron, which was completed in September 2013. Markets are identified by the largest city, which is usually located in the center of the market region. 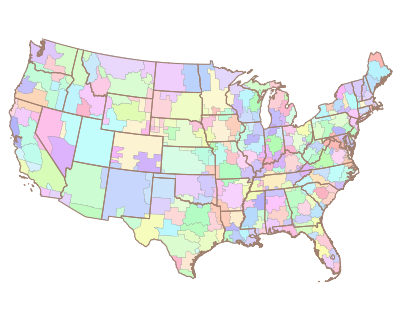 However, geography and the fact that some metropolitan areas have large cities separated by some distance can make markets have unusual shapes and result in two, three, or more names being used to identify a single region (such as Wichita-Hutchinson, Kansas; Chico-Redding, California; Albany-Schenectady-Troy, New York; and Harrisburg-Lebanon-Lancaster-York, Pennsylvania). In the United States, radio markets are generally a bit smaller than their television counterparts, as broadcast power restrictions are stricter for radio than TV, and TV reaches further via cable. AM band and FM band radio ratings are sometimes separated, as are broadcast and cable television. Market researchers also subdivide ratings demographically between different age groups, genders, and ethnic backgrounds; as well as psychographically between income levels and other non-physical factors. This information is used by advertisers to determine how to reach a specific audience. In countries such as the United Kingdom, a government body defines the media markets; in countries such as the United States, media regions are defined by a privately held institution, without government status. A Television Market Area (TMA) is a group of counties in the United States covered by a specific group of television stations. The term is used by the U.S. Government's Federal Communications Commission (FCC) to regulate broadcast, cable, and satellite transmissions, according to the Code of Federal Regulations, at 47 CFR § 76.51 and FCC.gov. The TMAs not only have full control over local broadcasts, but also delineate which channels will be received by satellite or cable subscribers ("must-carry" rules). These market areas can also be used to define restrictions on rebroadcasting of broadcast television signals. Generally speaking, only stations within the same market area can be rebroadcast. The only exception to this rule is the "significantly viewed" list. Virtually all of the United States is located within the boundaries of exactly one TMA. A similar term used by Nielsen Media Research is the Designated Market Area (DMA), and they control the trademark on it. DMAs are used by Nielsen Media Research to identify TV stations that best reach an area and attract the most viewers. There are 210 Nielsen DMAs in the United States, 56 of which are metered (in other words, viewership in these markets are estimated automatically instead of through the archaic diary system still in use in the smaller markets). TMAs may cover a much larger area than the stations that serve it, especially since the digital television transition. This is particularly true in markets that have hilly or mountainous terrain that is ill-suited for digital broadcasting. In these cases, the outlying areas of a TMA may only be served by cable and satellite, or perhaps by small translators. (There are some cases, such as that of Olean, New York, where a sizable number of independent stations operate, but none carry any major network affiliation unless they operate as translators. Because of this, Olean is considered part of the Buffalo, New York market despite none of that city's major signals reaching the city from 70 miles away.) Conversely, a geographically small market such as Erie, Pennsylvania may have stations where their signal spills well over into neighboring TMAs (most of Chautauqua County, New York is closer to Erie than Buffalo, but the county is also located within the Buffalo DMA). Arbitron (now Nielsen Audio) at one time also maintained similar areas for television ratings, each called an area of dominant influence (ADI). There were 286 ADI's in the United States. Arbitron stopped offering a television ratings service. Nielsen Audio (previously Arbitron) maintains smaller areas for radio stations; each is called an Arbitron Radio Metro. Whereas a typical TMA may cover ten counties, an Arbitron market generally covers two to four, and a TMA may contain two to four separate Radio Metros. There are 302 Radio Metros in the United States, but not all areas of the country are covered. In 2009, Nielsen began offering radio ratings in competition with Arbitron, starting in those markets ranked 101st and smaller. ^ "Nielsen Acquires Arbitron". nielsen.com. Retrieved 3 March 2018. ^ See the PDF's at "Television Measurement". nielsen.com. Wayback Machine. Archived from the original on December 9, 2012. Retrieved January 11, 2013. ^ "Radio Measurement | Radio Audience". Nielsen. Archived from the original on August 13, 2012. Retrieved 2013-06-25.